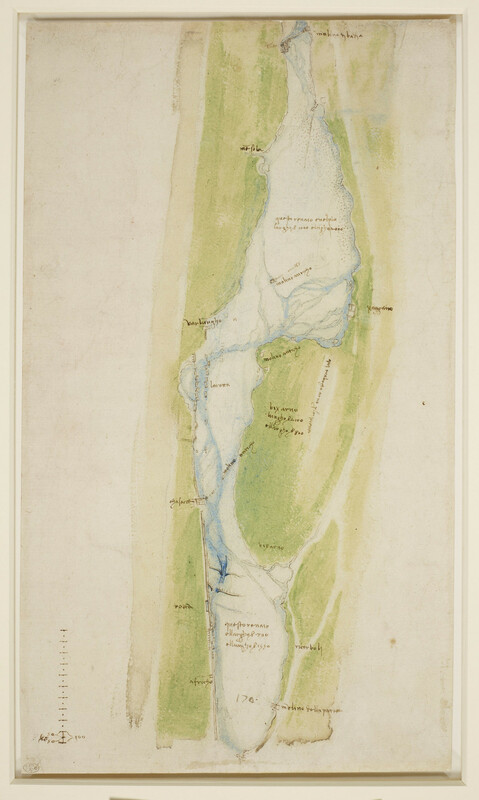 A map of the bed of the Arno, to the east of Florence, from the Africo to the Mensola, showing a method for leading off the water; also, explanatory notes In the summer of 1504 Leonardo surveyed the Arno near Florence and produced a number of maps of the river. The notes are in conventional script (unlike Leonardo’s usual mirror writing), and the maps are carefully finished with coloured washes. This, and the emphasis here on the damage to the embankment where the water passes through a weir, suggest that the maps were commissioned by the Florentine government as surveys of territory that required civic maintenance.